The AMS Mitsubishi Evolution X Stage 0 was developed to transform your EVO X into what it should have been when you drove it off the lot without breaking the bank! As with many high performance vehicles, the Evolution X was delivered from the factory with a conservative tune in relation to its full stock potential. Stage 0 will safely increase horsepower and torque levels without the use or need for additional aftermarket parts. By performing an AMS custom re-flash on the stock ECU, we are able to extract almost 50 HP with no additional upgrades or modifications! Our safe and proven tuning solution works by optimizing the performance of your ECU’s fuel and timing curves, the MIVEC system, as well as the fuel cut for improved throttle response, quicker spool up and maximum power throughout the RPM range. 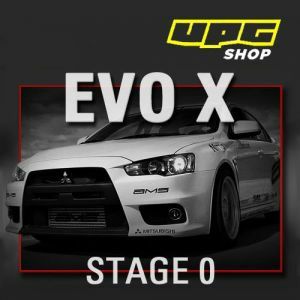 When price vs. power gains are considered, the EVO X Stage 0 is definitely one of the best bangs for the buck and is an ideal upgrade for anyone looking to safely squeeze more power from their EVO X while maintaining its reliability, stock appearance and driveability. AMS offers two options for the Stage 0. Customers can either mail in their ECU for the re-flash, or select the Cobb AccessPort (AP) option with the tune file already loaded onto the unit for added flexibility and features. All tune files will have the latest Mitsubishi re-flash currently available. We carry the most current files around 1-3 days after they are released from Mitsubishi. This option requires that you remove and mail in your stock ECU. The process is fairly quick and easy with very little downtime for your vehicle. In most cases, the re-flash is completed and mailed back to the customer the very same day it is received. So depending on the shipping option you choose, total turn-around time can be minimized to as little as three days. Depending on your future tuning needs, a Cobb AccessPort might be the right choice for you. This option allows you to load the Stage 0 re-flash onto your ECU via your own Cobb Acessport unit without having to remove it or send it in – meaning no downtime for your vehicle. In addition, it allows you to easily switch back and forth between the stock map and Stage 0 map as well as add new ones. NOTE: The Stage 0 re-flash cannot be used with any aftermarket parts aside from a cat-back exhaust. If an intake or further modifications are used with this re- flash, serious engine damage can occur. Please contact AMS for a custom re-flash to support additional modifications.